I expect a lot of people to say Cloud Boba to be their favourite of all time so let's just say your top three in no particular order. Jango Fett: He's my favorite character and he looks so cool. Cloud Boba Fett: My second favorite character and the legs are cool. Odd, thought we had one of these, but I guess not. Couldn't find the thread. Greedo - I absolutely love that little figure, and he steals any scene that he's in. Darth Vader - It's Darth * bleep * Vader for Gods sakes... and he's rendered in LEGO. The circle is complete. Honorable mentions though: Endor Luke Skywalker, Yoda, and the Destroyer Droids. the orange Rebel X & Y wing pilots: all of 'em, love those helmets! Jango Fett, like everyone else has said, he is rare and really sharp looking. Plus it's a Fett, enough said. Episode 3 Anakin, he just looks alot cooler then in episode 2 and 1. And I really like the mini fig. Slave Leia, as dWhisper said, this fig is just so funny to look at. I'm not completely sure why still. close but no cigar: 7190 leia, royal guard, vader, ewok, grevious, gungan, hoth rebel, jawa, lobot, scout trooper, watto. - ep 2 Clone, which I find interesting because as hasbro figs or pics in the movies they are my least favorite. My Blacktron I guy I got when I was a kid. Why does slave leai have no printing on the back? There we go, and that explains why it was eluding my search. Going for "minifig" was rather pointless, and I used "favorite" instead of "fave" or "favourite"
Mr Krabs although they are not starwars. Wow! So many minifigs it's kind of hard to remember them all off the top of my head. All three have great sculpted headgear and detailed outfits. I will answer this question later, but I have to say that this thread helps me out on a project I'm working on right now that should be "unveiled" here soon! And excuse my lameness, but what's a "Shocktrooper?" 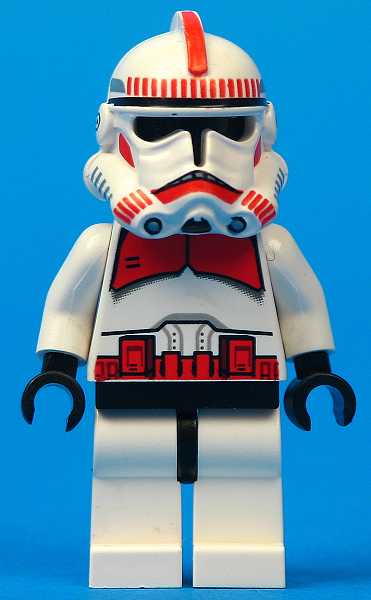 I just noticed that the shocktrooper has those "teeth" thingies in his "mouth" area. Lego's getting better at this printing thing.